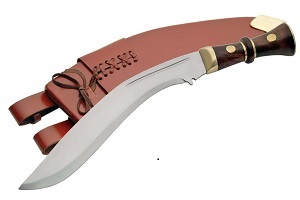 The kukri is an inwardly curved blade knife that is , and has been , used as a weapon as well as a tool for centuries in some South Asia countries such as Nepal and India. 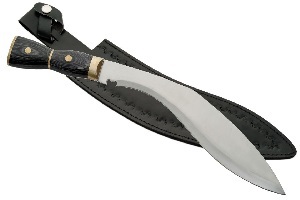 The kukri knife has become the weapon of choice for hand to hand combat for the Nepalese Army as well as the Royal Gurkha Rifles of the British Army and the Gurkha Regiments of the Indian Army. is an extraordinary collector grade knife that will complement your knife collection. The Cold Steel Kukri Machete is a solid inexpensive workhorse. Each Cold Steel Kukri Machete features the distinctive weight forward balance of the Cold Steel top-of-the-line models and they always present their edge on an angle so they are guaranteed to "bite" deep with every stroke. 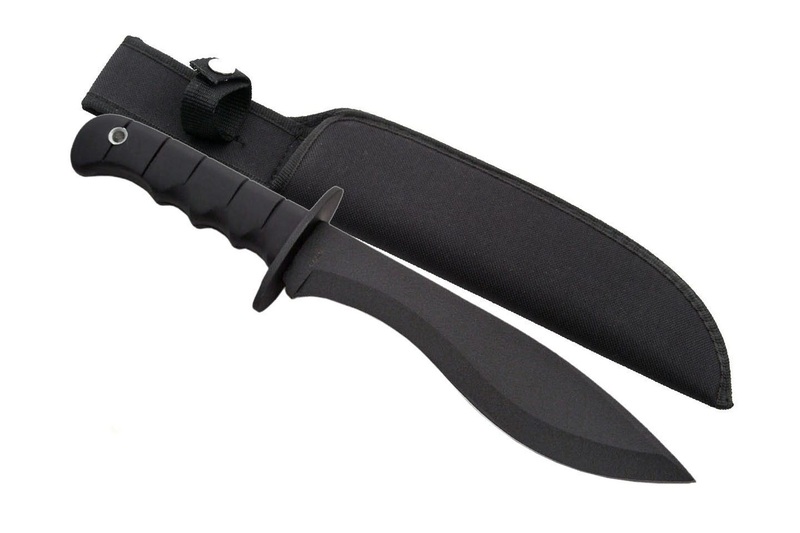 Additionally, the Cold Steel Kukri Machete comes complete with a sturdy Cor-Ex sheath! The Cold Steel Kukri Machete is a solid value , ready for long , hard work. 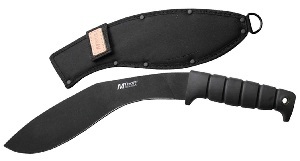 The Cold Steel Magnum Kukri Machete is a solid inexpensive workhorse. 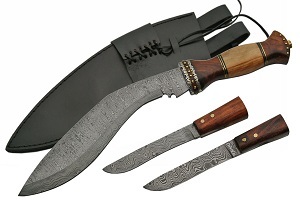 Each Cold Steel Kukri Machete features the distinctive weight forward balance of the Cold Steel top-of-the-line models and they always present their edge on an angle so they are guaranteed to "bite" deep with every stroke. 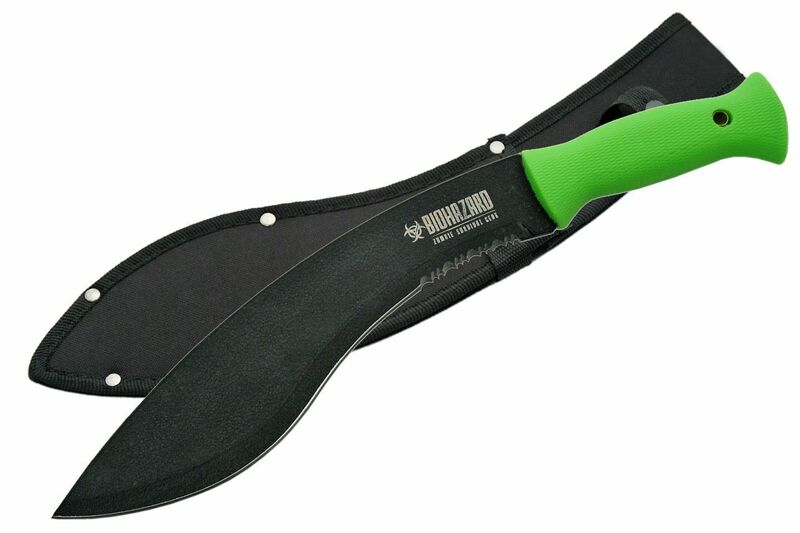 Additionally, the Cold Steel Kukri Machete comes complete with a sturdy Cor-Ex sheath! 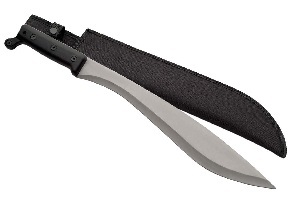 The Cold Steel Kukri Machete is a solid value , ready for long , hard work. The Kukri blade knife , with its markedly downward curved blade, has long been identified with the Gurkha Warriors of Nepal , the ferocious mercenaries who have who have wielded this knife for over 150 years in the service of the British Empire. The Cold Steel Gurkha Kukri was inspired by Cold Steel President , Lynn Thompson's close association with Dr. Maung Gyi , chief instructor of the American Bando Association and a renowned martial artist with wide ranging knowledge and skills. 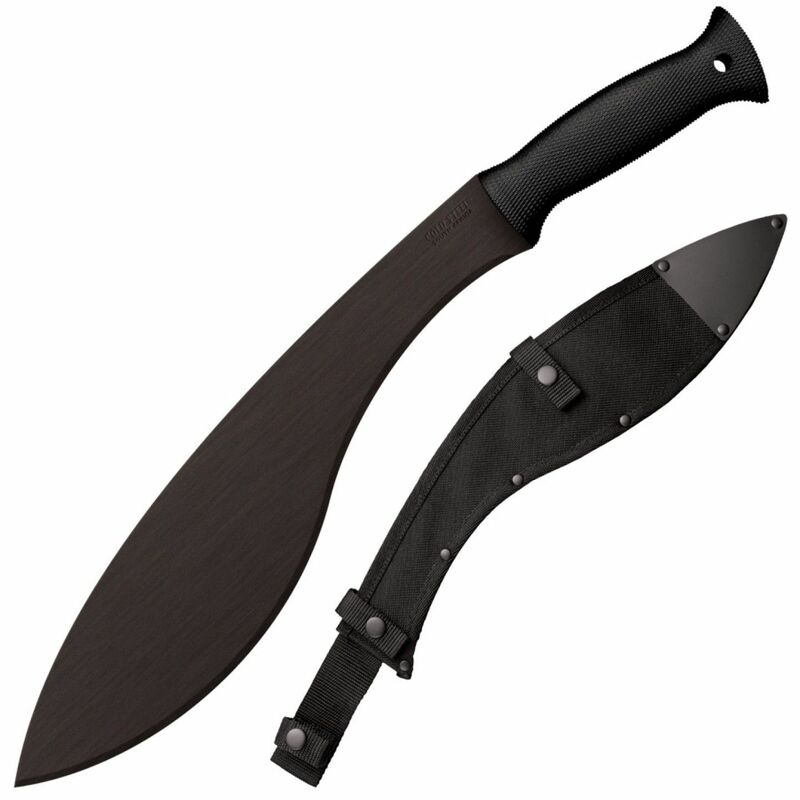 Under Dr. Gyi's tutelage , Mr. Thompson gained insight into the full potential of the Kukri knife and learned it was not just a chopping weapon but a piercing, slashing, and smashing weapon as well. 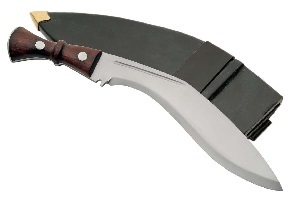 Smashing techniques allow the Kukri blade knife to function as a hammer or mallet or to deliver non-lethal blows in a self defense role. 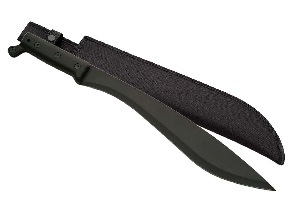 A concentrated blow with the back of the blade can break bones or be lethal if directed at the head. With Dr. Gyi's input , Lynn Thompson designed a longer , narrower point for the Cold Steel Gurkha Kukri with more distal tapering to the spine. 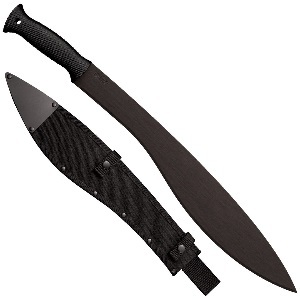 This resulted in a thinner, sharper point which can be deeply driven into thick, tough targets with minimal effort. 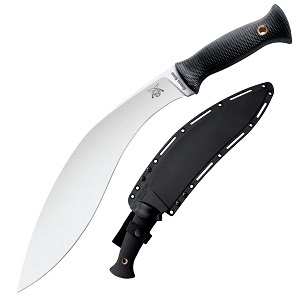 Finally a masterfully designed Kraton handle was added to maximize the blade's fierce potential. 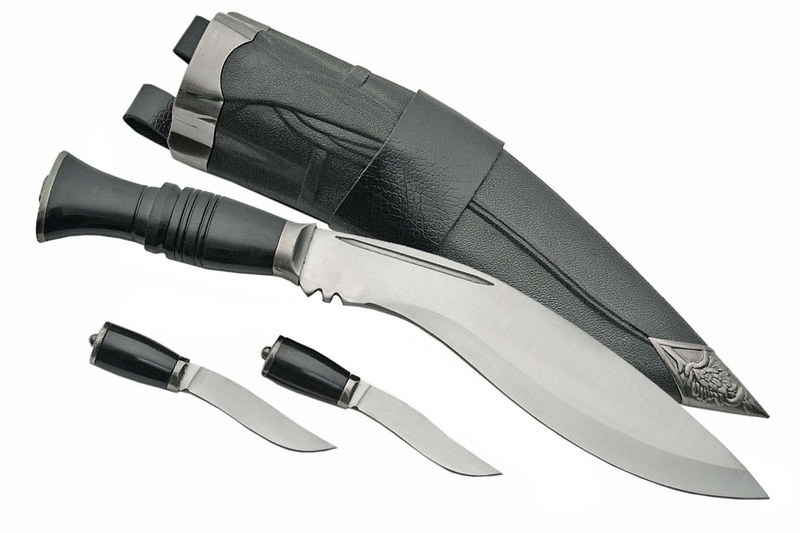 Perfectly contoured and deeply checkered, the Cold Steel Gurkha Kukri offers a superb non-slip grip and cushions the hand from the shock of the hardest blow. Each Cold Steel Gurkha Kukri is supplied with a Secure-Ex sheath to protect the blade and allow you to wear it safely and securely on your side always ready to defend you and your loved ones.